The Hunt Valley Business Forum is proud to support the 2017 Rappel for Kidney Health. Please join our member in this worthy cause. 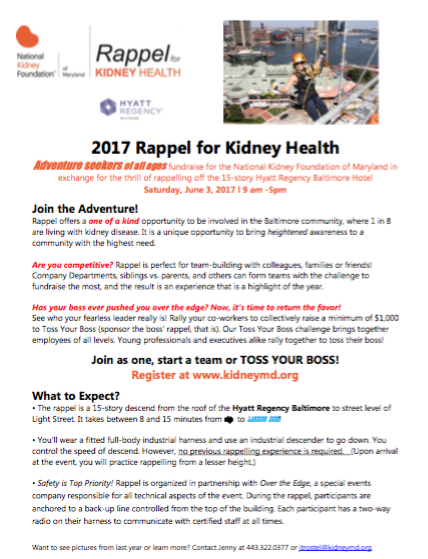 Adventure seekers of all ages fundraise for the National Kidney Foundation of Maryland in exchange for the thrill of rappelling off the 15-story Hyatt Regency Baltimore Hotel Saturday, June 3, 2017 from 9 am to 5 pm. JOIN AS ONE, START A TEAM OR TOSS YOUR BOSS!